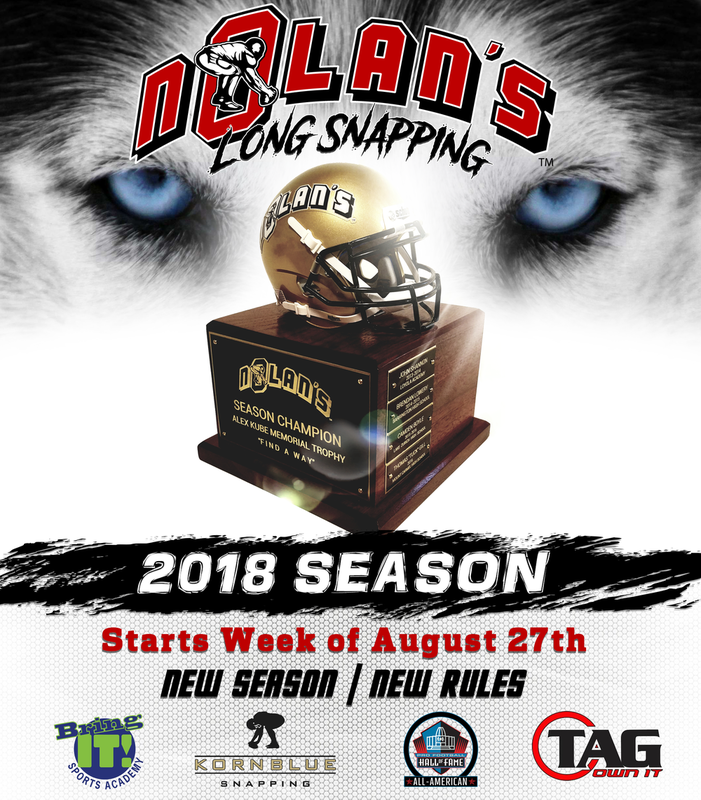 The Nolan's Season will start the Week of August 27th and end with the 2018-19 Playoffs on Sunday, January 13th, 2019. As of the 2018-2019 Season, Virtual Lesson Athletes are NOW INCLUDED in the Nolan's Season. 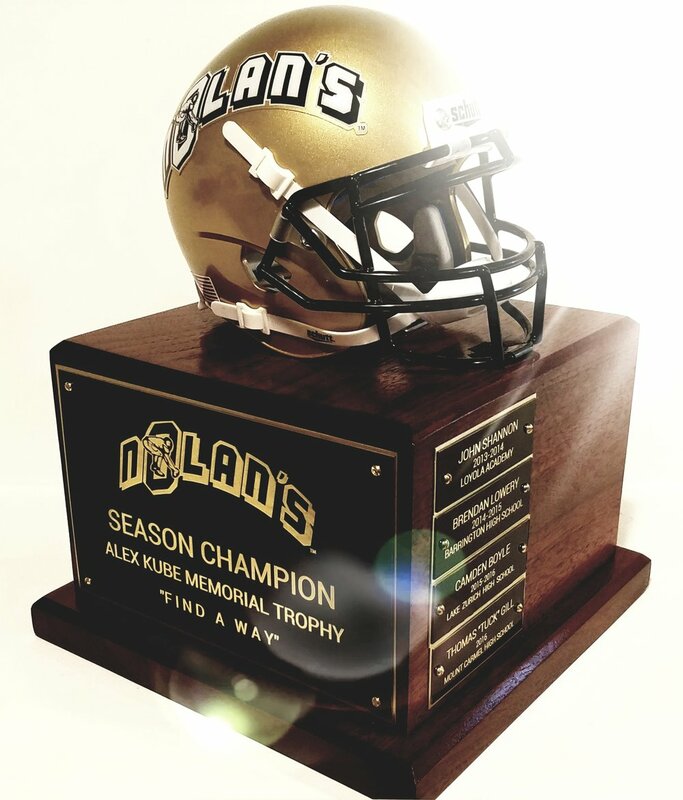 To be eligible to be named MVP of the Week, athletes must attend at least ONE Nolan's Long Snapping for that week. Only ONE Snapper will be named MVP of Week for all lessons held from Tuesday through Sunday. The previous week's MVP will be announced every Tuesday morning via Nolan's Long Snapping social media accounts. For Example: MVP of Week #1 (Aug 27 - Sep 2) will be announced on Tuesday, Sept. 4th. Nolan will be evaluating every athlete's performance throughout the entirety of the lesson. Nolan has the option to review an athlete's performance via film to come to a firm conclusion on who will be named MVP for that week. The Group #1 High Score Snapper(s) must go through a 2 PAT and 1 Punt Overtime Round after Regulation. If the Group #2 High Score Snapper(s) ties in points to the Group #1 High Score after Regulation, the Group #2 High Score Snapper(s) must too go through the 2 PAT and 1 Punt Overtime Round. The Snapper between the two groups with the most obtained points during the Overtime Round will be declared the Winner for that week. If in the event the participants from the separate groups remained tied after the Overtime Round, the snapper between the two groups with the BEST Overtime Round Punt Snap based on Judgement Call will be declared the Winner for that week. The Judgement Call Punt Snap will be based strictly off of the credentials of what a Division 1 College Coach looks for in a punt snap and it is up to Nolan's discretion. Point system and accuracy chart is based off of Nolan's Long Snapping Target Scoring System. Snappers accumulate points per snap for accuracy. PUNT ONLY -- It is worth 3 Points for the football to cleanly "swish" through the top box. PUNT ONLY -- It is worth 2 Points for the football to "bank in" through the top box. PUNT ONLY -- It is worth 1 Point for the football to hit any of the four poles surrounding the top box. PAT ONLY -- It is worth 1 Point for the football to go through the bottom box. MONEY BALL SNAP -- PUNT ONLY -- The final round of the competition will be done utilizing the legendary NFL Wilson Football. This snap is worth 4 Points for the football to cleanly "swish" through the top box. Points can ONLY be deducted on a snap to snap basis. A participant cannot have negative points. PUNT ONLY -- It is a minus of 1 point from that snap's achieved points for a wobbled snap (different than that of a slower rotation). Challenges are used when a snapper believes the points he or his competitor(s) achieved are different than what was given. Challenges are set to thirty (:30) second limits ONCE the video review has begun. Each snapper has one (1) challenge for that week’s competition. Once used they may not use a challenge for the remainder of the competition. There are NO BONUS challenges even if there is a sudden death tie-breaking PAT snap off. There is NO penalty for losing a challenge. Challenges are removed regardless if the challenge is won or lost. ONE MONTH of UNLIMITED Nolan's Long Snapping Lessons **All free lessons must be used within 30 days after winning the season.